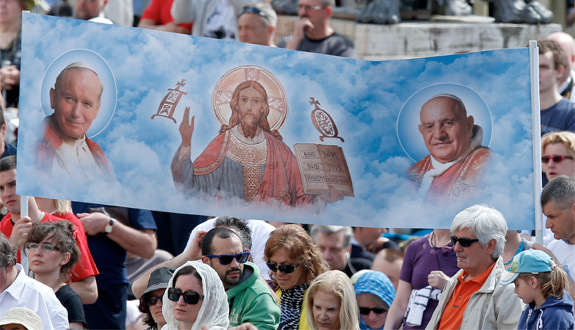 John XXIII and John Paul II were responsible for historic advances in overcoming the problems of division and estrangement between Catholics, Orthodox, and Protestants. The council which John called would produce the landmark documents, Unitatis Redintegratio and Orientalium Ecclesiarum. The first was concerned with Christian unity broadly conceived; the second focused on relations with the Christian East, especially the Eastern Catholic Churches. Both were very important and influential documents, and have ever after been referred to as the formal entry-point of the Catholic Church into the ecumenical movement begun in Edinburgh in 1910. Though Vatican II, as every thinking person by now concedes, was not a perfect council, and not everything coming out of it or attributed to it can be commended without cavil, the council was, in my estimation, worth all the effort if for no other reason than it produced these two texts and pushed forward the movement for Christian unity. I would still thank God for Pope John and the council fathers if they had published nothing more than these two documents and then gone home. John Paul II’s pontificate would have been inconceivable without Vatican II, and two of his most important texts, in particular, were built directly upon the ground broken by Unitatis Redintegratio and Orientalium Ecclesiarum. John Paul II, like John XXIII, made Christian unity a priority from the beginning of his pontificate. But it was not until 1995 that we saw how profoundly, deeply, and irrevocably committed he was to the ecumenical cause. That year he published two key documents. The first, the apostolic letter, Orientale Lumen (May 2, 1995), was in essence a love letter to the Christian East. In it, John Paul praised the liturgical, monastic, and spiritual life of the Eastern Churches, and insisted that their treasures were in fact the gifts of the entire Christian world, and certainly the entire Catholic Church. He called upon Roman Catholics to get to know, love, and esteem the Christian East and to see in her history, theology, iconography, and liturgies a sacred patrimony of beauty and truth that can—and must—enrich the whole Church. Here is where the famous metaphor (which was not original to him, but which he used to great effect) of the Church breathing “with both lungs” (East and West) came in. Almost simultaneous to the publication of this letter, he also published an encyclical, Ut Unum Sint (May 25, 1995), devoted entirely to the search for Christian unity. For those who know Catholic history in the twentieth century, this document is astounding in tone and details alike. John Paul writes with great and evident humility. The whole degrading business of “ecumenism by return” (whereby it was expected that non-Catholics return to Rome to kiss the papal foot, repent of their heresies, and be reconciled to the “Supreme Pontiff”) is entirely absent. Ut Unum Sint is a document shot through with a “kenotic ecumenism,” that is (following St. Paul in Phil. 2:7) a self-denying approach that seeks not its own glory but only the good of one’s brothers and sisters in Christ. Given the vast power and prestige behind the papacy, it is simply staggering that a pope would humble himself to make such a request. Nothing short of the Holy Spirit could have inspired that. Personally, I don’t need medical miracles to convince me of this man’s humility and sanctity—nor for John XXIII, either. The state of relations between Christians today has changed so much in a scant fifty years as to be little short of miraculous. I thank God for these two popes, who have made so much of that possible, and I am very much counting on their intercession in the years to come, because plainly the work is not finished. We must constantly invoke their intercession so that this good work they began can be brought to completion in full unity around the one table where the paschal feast of the Lamb never ends.